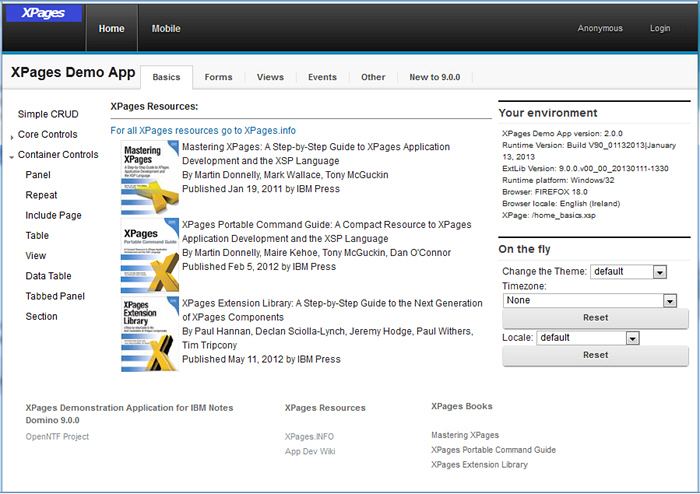 This version (2.0.0) of the XPages Demo App shows some of the additional XPages features and enhancements in IBM Domino Notes 9.0.0*. The app has been updated to use OneUI V3 and now uses the XPages Extension Library (com.ibm.xsp.extlib.library) which now comes out of the box with IBM Notes Domino 9.0.0. The layout out of the demo app now use the Application Layout Control (xe:applicationLayout) from the XPages Extension Library, and with it the app makes extensive use of the Navigation control (xe:navigator). These were the main changes to the app and the existing content was merged easily into the new layout and navigation without too much effort, especially when the previous releases used a OneUI based framework. The app also include some new examples from the 9.0.0 release including Send Mail and a Redirect control sample. The demo app now includes a Mobile sample too and this updated in future releases with even more examples in this area and in other areas. So watch this space. * At the time of the above release, January 2013, IBM Notes Domino 9.0.0 is only available as a public beta - pre-release software. This means that many of the software features shown in the XPages Demo App are in a pre-release format and so are not guaranteed to be in the final release of IBM Notes Domino 9.0.0.